I was an early re ader of Michael Moore’s first book, Downsize This!, consuming it at the time in the embattled corporate trenches, and lapping up every word. I was a little disappointed when he seemed to go off the rails with some of his later works. Maybe it was because in the boom times of the early 21st century, being a merchant of gloom was a little out of fashion with the long years of, cough, plenty. I mean, the NRA, talk about an easy target? 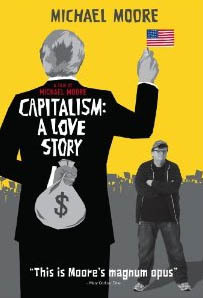 Well, dear readers, I am happy to report Michael Moore is firmly back on form and fighting for the little (wo)man again, with his new film, Capitalism: A Love Story. If you want to see an expose of why your tax bill has just shot up and you, your friends and family, have just been laid off (or shortly will be), this film is as eloquent as it comes. Here’s some clips from the movie, and if you get a chance to borrow this one from your DVD library, do. It’s fascinating stuff. One of the best bits is the start, where he inter-cuts an old documentary on the fall of the Roman Empire with images from more recent times. Is the American Empire ending, and will the UK – Greece to their Rome – go down the porcelain basin at the same time? Now, I must get around to seeing Wall Street II at some point. Old Gordon Gekko was quite a role model for us children of the 1980s. You wait, give it a decade or so. and you’ll find out how short memories are. Greed will be good again. Michael Moore can be a little annoying at times. Often, he is his own worst enemy when it comes to getting his (important) messages across. I agree, though, on balance, this film is his best yet. Maybe because we’re all suffering so much after the credit crunch, it has some extra resonance for us mugs in worker land.